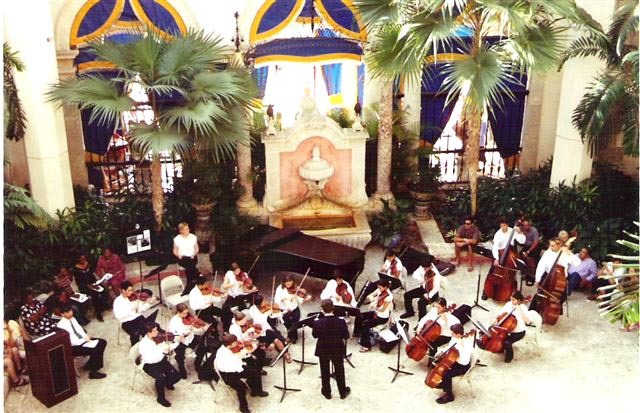 An orchestra performs at the Vizcaya Museum and Gardens, a 1916 Italianate villa which is a National Historic Landmark. Miami, Florida, (pop. 362,000), was founded in 1896. From its early years as a sunny resort town, the city has grown into an international metropolis. Miami was home to the Tequesta peoples more than 10,000 years ago. It was “rediscovered” by the Spanish in the 16th century, became a refuge for Seminole and Miccosukee Indians in the 19th century and then a magnet for pioneers and entrepreneurs in the 19th to early 20th centuries. Today, its strong ties to Caribbean nations have made Miami one of the most diverse cities in the United States. Miami's history and continued diversity are reflected in Miami Circle (Tequesta), the shops along Calle Ocho (Cuban), and the Caribbean Market (Haitian). In Miami, grand palaces such as Vizcaya and the Deering Estate coexist with more modest buildings, such as the pioneer homes in Coconut Grove, Miami’s historic Bahamian community. Cutting-edge architects attracted to the city have interpreted Miami’s style through Art Deco, Mediterranean Revival, and Miami Modern (MiMo) constructions. Miami is home to eight historic districts, several archaeological zones, and more than 109 individual historic sites. The city recently created the Biscayne Boulevard Historic District, which encompasses 65 historic structures, many of them motels built in the Miami Modern style that flourished between 1945 and the late 1960s. A popular tourist destination is the National Historic Landmark Vizcaya Museum and Gardens, a 1916 Italian Villa. Each year, Dade Heritage Days celebrates Miami-Dade County’s architectural, environmental, and cultural heritage during eight weeks of events such as open houses, tours, historic exhibits, lectures, concerts, and special programs at historic landmarks. The downtown Historical Museum of Southern Florida features permanent and changing exhibits on the region’s rich history.